Call me “Old Fashioned” but I still strongly believe in the power of a paper greeting card. I know in the days of email and evites and cell phones and text messages that people no longer send cards as much as they used to, but for big events like Christmas and birthdays and thank you, I am still an avid greeting card user. And since most of my family is on the other side of the country (or even in foreign countries.. if you want to consider Canada as ‘foreign’) I need to send most of my cards by mail. I know that is another reason that people have begun shying away from paper greeting cards, since you need to do a little planning ahead in order to send smiles to someone. 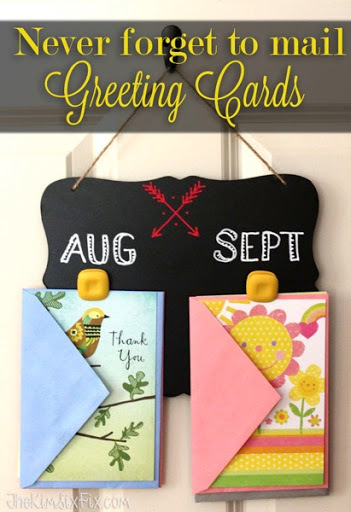 Well I have developed a sure fire system to help you get a handle on your greeting cards, so you will NEVER be late again (since nobody really likes those “Happy Belated Birthday cards.”) And it is easy! First you need a list of important events and greeting card worthy happenings (birthdays, weddings, anniversaries, holidays) so you can stock up on greeting cards. And to stock up on cards, without breaking the bank, Walmart is the place to go. They feature authentic Hallmark brand cards including an entire line that only cost 47 cents! Walmart is the only place you will find these cards at that great low price. It means that you can buy dozens of cards for months in advance without spending a small fortune. I took my list of upcoming birthdays to the store and got everything I needed in one shopping trip! For example, TODAY is my mom’s birthday.. and next month there are two weddings in the family and a few other birthdays. I got all those cards plus a few thank you cards to send to people who sent me gifts on my birthday (which was last week!) in the 47 cent Hallmark section. and of course, your Hallmark cards. You can either hot glue or use super glue to add the clips to the bulletin board. You want to leave enough room above the clips to give you a place to write. You also want to leave enough room between the clips to hold the cards. You can buy a bigger chalkboard if you want to include more months but I like only going out 2 months in advance. Next I use the chalk to decorate the board and add the months above each clip. That is where you are going to store the cards before mailing. Now hang the clipboard somewhere (preferably where you will see it regularly.. I have mine near the calendar so I always can keep track of the date). And here is the KEY to not forgetting to mail them. Make sure when you buy them, you fill out the address so they are ready to go before you even clip them to the organizer. I sit down and add the mailing address and my return address on ALL the cards at once. Since half the reason my cards used to go out late what that I was too lazy to go track down the addresses. If you are going one card, it typically isn’t harder to address more than one, while you have your address book available. And because you want the cards to get there on the right day, in the upper right hand corner of each envelope I write the MAIL OUT DATE. Not the date you want it to arrive, but the date you need to send it. Because a birthday card to my sister in Canada will take a lot longer to arrive than a thank you card to the neighbor down the street I can count back exactly the correct number of days I need to make sure the card arrives on time based on location. The beauty of using a chalkboard to organize is that you can just wipe off the date at the end of the month and add the next month in it’s place. You can always be up to date. So now that you have a handle on how to manage their mailing, which cards are you going to stock up on? If you are looking for creative ideas and holidays, make sure to visit Hallmark on Twitter, Pinterest, Facebook, Instagram or YouTube.